BA’s First A380 Exits The Hangar! 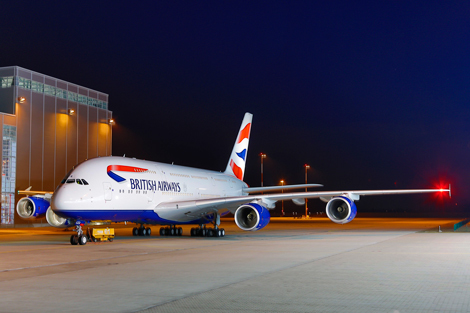 British Airways’ first Airbus A380 aircraft has exited the hangar in Hamburg newly painted in BA livery and looks amazing. Twenty four workers applied 2,300 litres of paint across 3,500 sqms of surface. The aircraft’s interior has also been fully fitted and is now enroute to Toulouse for final checks ahead of its July delivery. The aircraft will operate from London to Los Angeles and Hong Kong in October and November respectively and will feature 469 seats across four cabins. https://gtm.uk.com/wp-content/uploads/2015/05/logo_trans.png 0 0 Paul https://gtm.uk.com/wp-content/uploads/2015/05/logo_trans.png Paul2013-04-11 12:59:232013-04-11 13:01:14BA's First A380 Exits The Hangar! Amazing Finnair Prices to Asia! Book air fares to China & Japan from just £62! For a limited period only Finnair are selling flights from London & Manchester to various destinations in China & Japan, however, the selling period ends on 12th November 2012. The headline fare of £62 applies to Chongqing in China. The highest fare to any of the following destinations is only £123 (prices exclude airport taxes and fuel surcharge) : Hong Kong, Beijing, Shanghai, Tokyo, Osaka & Nagoya. Whilst the sales period ends on 12 November, travel can take place right through to 31st March 2013. NB. Finnair flights connect via Helsinki, which is widely regarded as an efficent airport to transfer in, with minimal time spent on the ground. https://gtm.uk.com/wp-content/uploads/2015/05/logo_trans.png 0 0 Paul https://gtm.uk.com/wp-content/uploads/2015/05/logo_trans.png Paul2012-11-07 15:00:032012-11-07 14:52:43Amazing Finnair Prices to Asia!